How create a WooCommerce discount per payment method? How to create a WooCommerce discount per payment method? A payment gateway is a service that allows a customer to pay for his order using credit cards or direct payments methods. While there are hundreds of payment methods out there, they are not all the same. Some may be advantageous for the customers while others are more convenient for the merchants. The best way to guide the customer choice to a payment method that is convenient for the seller is to give him an incentive to do so. In today’s article, you will learn how to create a discount, based on the customer’s selected payment gateway at the checkout using WooCommerce All Discounts. How to create a discount per payment method in WooCommerce? Set up the basic discount properties such as the start and end date, periodicity and user limit or leave them empty to enable the discount all the time. Select “If payment gateway” as condition. Set the operator to “IN” or “NOT IN” depending on your needs. Then select the payment method you need to apply or exclude from the discount. 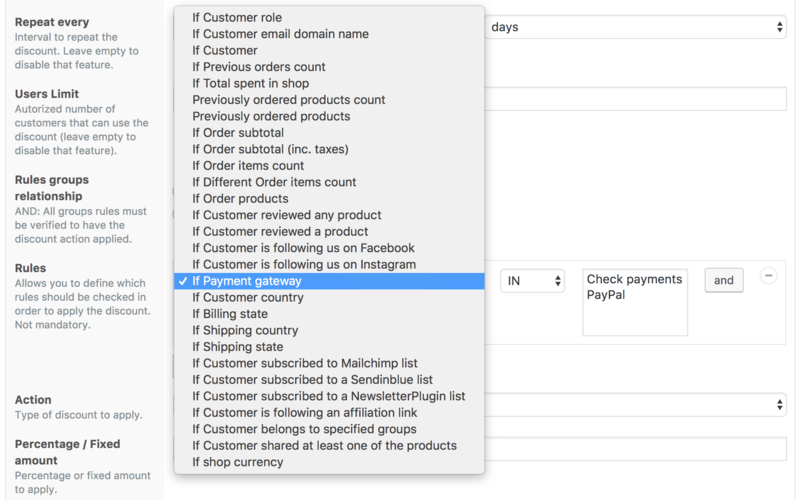 WooCommerce All Discounts is able to automatically detect all active payment gateways in your shop even custom ones. This completes our tutorial on how to create discounts per payment method using WooCommerce All Discounts. If you have any questions, use the comments section to ask.